The Belgian was given a rare start on Sunday at the heart of defence alongside Pique. Though the centre-back didn’t have a lot on his plate throughout the evening, he did have a crucial role to play in Leganes’ equaliser. When the away side broke through midfield, all of Barcelona’s defenders stepped up. But, Vermaelen failed to maintain the defensive line and allowed the Leganes’ forward to get goal-side and whip a delicious cross for Braithwaite to prod home. Apart from the error, he never looked comfortable on the ball and was troubled by the raw strength of Braithwaite. The Belgian has been ravaged by injuries for a long time and he may just have lost the edge which once made him a highly-rated defender. 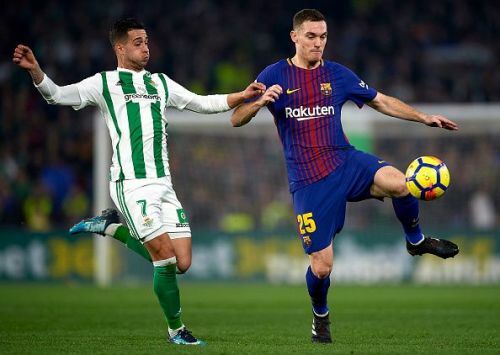 At present, he looks too rusty and slow to adapt to the rigours of the LaLiga and if Barcelona are intent on challenging on multiple fronts, they certainly need to consider options better than Vermaelen.